Rand traders aren’t quite discounting the chance of a South African rate increase, even after inflation fell to a seven-month low. The currency gained as much as 1.1% on Wednesday, outperforming emerging-market peers, after data showed price increases slowed to 4.5% in December, right on the mid-point of the target range. That’s where the central bank wants to keep it, according to Governor Lesetja Kganyago - and traders apparently took note. While risks to global economic growth are "without a doubt" a dominant concern and the domestic inflation outlook is largely "contained", it’s important to anchor inflation at the midpoint to allow flexibility to deal with price shocks, Kganyago said in an interview with Bloomberg TV in Davos. The Reserve Bank left its policy rate unchanged at 6.75% and revised its forecasts for inflation lower last week, a move widely interpreted as a dovish tilt. Forward-rate agreements are pricing less than a 25% chance of a 25-point rate increase in the next 12 months. But future policy would be data dependent, meaning an increase can’t be ruled out. Risks to the inflation outlook remain to the upside, on possible rand depreciation and increases in administered prices, particularly electricity tariffs, said Annabel Bishop, chief economist at Investec. "Moreover, food prices could come under renewed upside price pressures owing to dry weather conditions that could adversely affect maize production in 2019," she wrote in a note to clients. 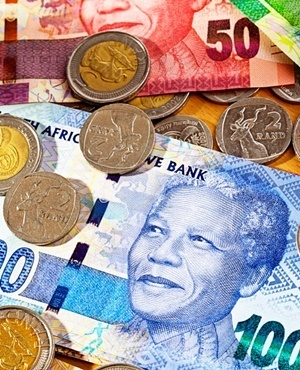 The rand was 0.9% stronger at 13.8479 per dollar by 2pm in Johannesburg, the best performance out of 24 emerging-market currencies tracked by Bloomberg.